The Korea campaign, closing today, was one of the largest we ever ran. In the last 13 days, it grew from 11,295, which was already pretty good, to 14,566 — a gain of 3,271 during the Christmas period. Our Kazakhstan campaign continues to grow, albeit slower — we’re now up to 10,731, a gain of over 730 in the last two weeks. We’ll be a launching a new campaign in support of United Steelworkers Canada after the new year. The earlier version was closed five days ago. We closed two other campaigns (Honduras and UN staff) a week ago. Berlin 2014: We’re up to 241 registrants, 50 from Germany, 36 from the UK, and the remaining 155 from 51 other countries. In another 11 days, Tom and I head over to Berlin to meet the organizing committee there. I’ve done a mailing to all registrants and we now have the option to de-register people who cannot attend. As I’ve explained before, many of the registrants have asked about subsidies even though we’ve repeatedly explained that everyone must pay their own way. Mailing lists: These continue to grow and grow. We’re ending the year with 97,100 addresses on our top three lists: English – 84,853; French – 7,112; Spanish – 5,135. A year ago, those three lists totalled 85,501— a net gain of 11,599, or nearly 14%. We picked up another 5 new Twitter followers in the last 5 days, bringing our total to 11,243. It was 8,115 a year ago — a growth of 3,128, or almost 39%. This is much higher than the growth of our mailing lists. We have considerably fewer supporters on Facebook, with only 8,267. A year ago that number was 5,877, so we’ve picked up 2,390 new fans on Facebook — a gain of over 40%. Sales of our latest book, Firefox OS for Activists, continue to slowly grow. We sold 97 paperbacks and 115 Kindle editions, for a total of 212. I’ll report on sales of our other titles in the new year. I’ve just closed two campaigns that ran their 3 month courses — in defense of the Honduran dock workers’ leader Victor Crespo, and in support of the UN staff workers’ union. I’m waiting to hear from our partners to find out what effect, if any, these campaigns had. The UN campaign was one of our largest, generating 14,581 messages in 19 languages. Meanwhile, our Korea campaign continues to grow. Even though very large numbers of our supporters are not online this week, we picked up an additional 1,011 supporters in the last 24 hours. We’re now up to 13,715 supporters for the Korea campaign. As you will all no doubt be aware, the South Korean government has brutally cracked down on the striking railway workers, making over 130 arrests. The unions have decided to call a general strike on 28 December. It is vital that we all do what we can in the next few days to build support for those workers. Today I posted extensively to social networks, contacted directly the general secretaries of some railway workers unions who could be quite helpful, wrote to the BBC, CNN, Sky News and Al Jazeera to ask why they’re all ignoring this story, and am just about to send off another mass mailing to our English list. Campaigns: No new campaigns were added in the last 7 days — but we’ve seen tremendous support for the two most recent ones (Kazakhstan and Korea). The Korea railway workers campaign is our second largest current campaign with 11,295 supporters – it will take another 3,262 to make it number 1, which is unlikely to happen. Still, we picked up 2,522 new supporters in the last 24 hours (that’s right — more than 100 per hour), so you never know. We’ve been talking with the Georgian Trade Union Confederation (GTUC) about getting our campaigns up in the Georgian language and they’re keen to help. One new feature of campaigns is I now do a mailing one week after campaign launch to the people who signed up. This is a one-off (they’re not necessarily on our mailing list) and I use it to update them on what’s happening, to thank them, and to encourage them to spread the word (with details on how to do this with Twitter, Facebook, emails, etc). These messages have a VERY high open rate and they are read, so I will do them for all future campaigns. The next step is to see if we can do this in additional languages. Mailing lists: I did a full report on the huge growth of our bigger mailing lists — nearly 16,000 new subscribers to the top 10 lists since January. See below for details. Berlin 2014: The number of registrants has gone up by 26 this week, most of those coming from the UK and Germany. At the moment we have 223 registrants, 49 of them from Germany and 33 from the UK. The registration form is now available in Dutch — as well as English, German, and Russian. Tom and Eric will visit Berlin on 11 January to meet with the organizing committee, which is doing fantastic work on the ground. There’s now an ad with a link to the conference website on all LabourStart home pages in all languages. We now have a way to modify information submitted by registrants. People who live in Berlin and can offer “solidarity housing” now have the option to do so from the registration page. (About half the people who’ve signed up are requesting this, but many of those are people who I do not expect to attend the conference.) We’ve now made some block bookings at a local hotel and hostel — if you’ve not yet booked, please do so soon. Our Kazakhstan campaign was getting very close to 10,000 supporters already yesterday, so no surprise that it finally reached that number this afternoon. But our Korea campaign also grew very rapidly today — picking up 1,345 new supporters in the last 7 hours and reaching 10,000 a few minutes ago. They are among the largest campaigns we’ve ever done. All out to support the Korean railway workers! By now you should have seen the message going out to LabourStart’s mailing lists (below is the full text) – things are heating up in South Korea. Because of the seriousness of this, we’ve dropped everything else here in the LabourStart War Room and are totally focussed on building our campaign and growing awareness of the strike and the repression. Posted top news stories on LabourStart — of which there are now many. Using Twitter, publicly contacted key unions, national trade union centres, global union federations, NGOs and the ITUC. Our message has been retweeted by the UK transport workers union TSSA and its general secretary, Union Solidarity International in the UK, COSATU in South Africa and the TUC in the UK so far. By email, contacted other groups including Amnesty, and British transport unions RMT and ASLEF. Did a mass mailing to our main English list and to all UnionBook members; asked our translators to get the mailing ready for other lists too. Translated mailings have already gone out in Indonesian, French, Russian, Finnish, Farsi, German and Dutch with more on the way. Contacted (mostly British) mainstream media organizations which incredibly have nothing at all on this story — the BBC, CNN, ITN, Sky News, the Guardian, and the Independent. Two weeks ago I asked for your support as Korean railway workers were about to launch a strike. They were concerned back then that their government might attempt to break the strike. They wanted the solidarity of workers around the world. They wanted a clear message sent to their government and nearly 9,000 of you sent off messages of protest. Today, their worst fears are coming true. 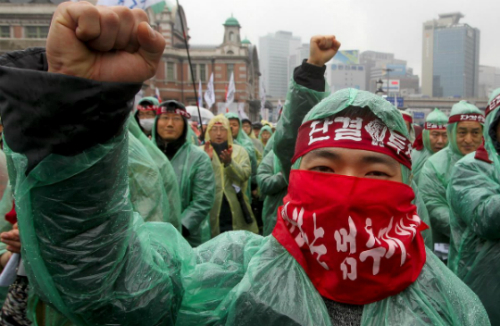 Just a few days into their strike, the Korean government has launched a savage crackdown. A few hours ago, the offices of the railway workers union were raided by dozens of police. Computers and other equipment were seized. Arrest warrants have been issued for the top union leaders — who are currently hiding in a safe place. Korean media are reporting that the military is prepared to send hundreds of soldiers to work as strike-breakers. Tomorrow morning, the subway workers in Seoul are set to launch a solidarity strike, shutting down the capital. It is our job now to mobilize the widest possible support for the Korean railway workers. Those workers are on the front lines today of the fight against neo-liberal policies such as privatisation — and they are defending the basic human right to have independent trade unions with the right to strike. Post this link to your Facebook page: http://bit.ly/1c8Uao8 Tell your friends there that you support this campaign and urge them all to do so. If your union has a mailing list of its members, make sure they are all informed about this important struggle. There are many millions of organized workers out there who aren’t aware of this fight. Please email your fellow union members. LabourStart’s top 10 mailing lists picked up a net gain of 15,586 subscribers in 2013 (so far). The most impressive gain (in relative terms) was the Korean list which grew almost 20-fold in the last 12 months (and nearly all of that this week). The Dutch list grew by more than 80%. The German list grew by more than 50% this year, which is great leading into 2014 and our conference in Berlin. Of the larger lists, the net growth of 9,233 for the English list is impressive. The only lists in the top ten that will need to be pushed harder next year are Italian and Turkish. Here is the full list, with the current size followed by where we stood a year ago. One of my ongoing gripes is that unions that ask LabourStart for campaigns sometimes do very little to promote them to their own members. An opportunity to bring members of a new union, or even a new country, into the network of people who regularly support our campaigns is therefore missed. In the past, I’ve chided some of our Korean comrades for this and in the last week we’ve seen a complete turnaround. The Korean teachers union and the railway workers union have mobilized members and supporters in their own ranks, in their own country, and these have been added to the thousands from outside Korea to support our current campaigns. The result is that our Korean language mailing list has grown ten-fold almost overnight, from just over 150 (where it had languished for months) to 1,646 this morning. It has gone from being our 21st largest language to being our 9th. The real test will be what happens when we mail to this list about a non-Korean campaign – for example, our current campaign on Kazakhstan. Will we see a strong response? We’ll try to test this later today. Mailing lists: Due to an extraordinary effort by the Korean teachers’ union to build support in the country for their campaign, we picked up several hundred Koreans for our mailing list. As a result, Korean has gone from being our 21st largest list to being the 11th largest, with 714 subscribers (this was just 173 a month ago). Berlin 2014: Two weeks ago I reported that we had 128 people signed up for the conference; today that number is 197. The largest groups are from Germany (44), the UK (24), Pakistan (15), Liberia (12) and Nigeria (11). I’m still not certain that the comrades from Pakistan, Liberia and Nigeria and some other countries have fully understood that LabourStart is not covering airfares, although it’s possible that some of them will be in Berlin for the ITUC. The registration form is now available in Russian as well as English and German; we expect that a Dutch version is on the way. Tom and Edd developed a comprehensive strategy for promoting the conference to a UK audience, so we should see the size of the UK contingent grow. Meanwhile, I’ve focussed some attention on building participation from Finland, Denmark, Israel, the Czech Republic and Poland, with more countries coming soon. Books: We’re about to begin work on book 4 — a collection of essays by former IUF General Secretary Dan Gallin. Sales of the earlier books and calendar remain sluggish.